The ollie is an essential gateway to skateboarding, a fundamental piece of magic from a wonderful bag of tricks. 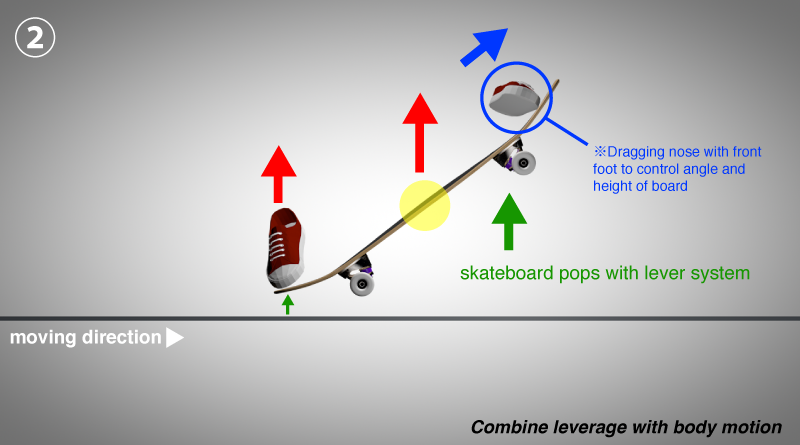 When you see skaters seeming to levitate momentarily on their skateboards, you may wonder, “How does that skateboard stick to that rider’s feet?” Here is how it works and how to do it. What Makes the Ollie Possible? Whereas the back foot provides the ‘pop’ (power), the front foot is used for control. 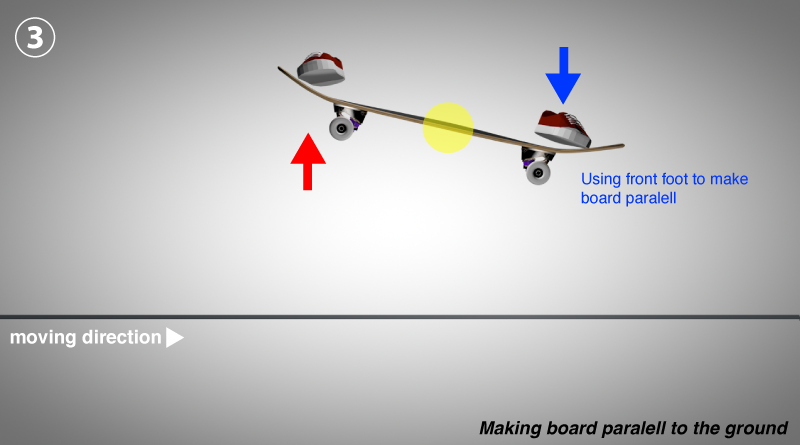 You can level your skateboard in the air horizontal to the ground by using your front foot as a guide. That is how the ollie works. 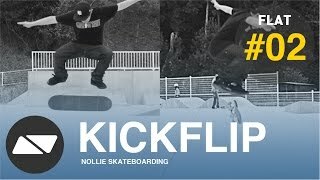 Now let’s move on to how you can develop your ollie. Place your back foot on the edge of the tail (this is where you will apply a burst of force to the skateboard) and prepare to exert force through the foot’s ‘big-toe-mound’ area. Place your front foot behind the front bolts. 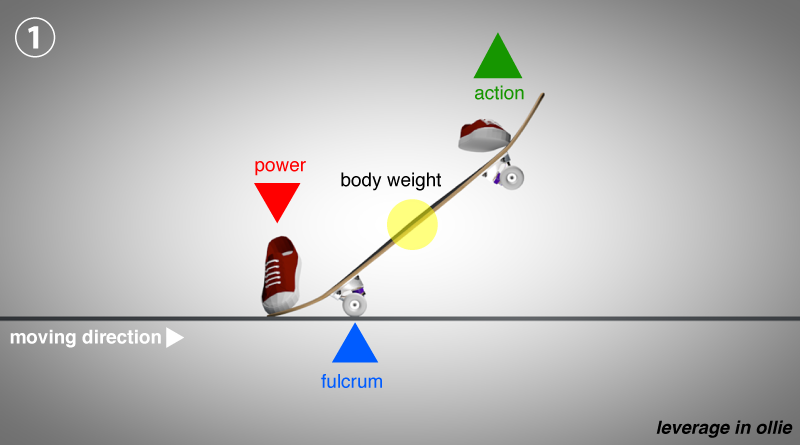 Make sure the weight bearing down on your feet, as well as the weight of your body, is generally centered over the ‘middle line’ of your skateboard. When you feel comfortable in your proper ready stance, bend your knees a little and continue by applying a burst of force with your back foot to the tail of the skateboard. Your upper body should be slightly ‘opened,’ and a good spot to keep your eyes as you learn the trick is on the nose of the skateboard. Simultaneous to the application of your back foots burst of force to the tail, jump straight up with your upper body. Practice keeping your body and your balance over the centre of the board at all times. 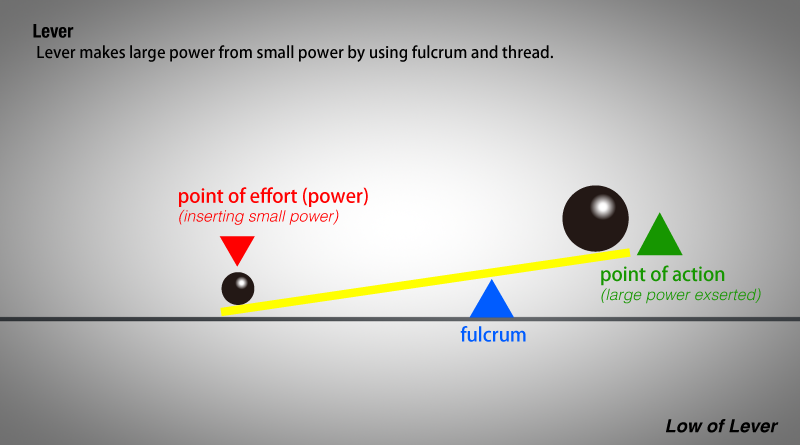 Failure to do so increases the likelihood of failed landings or sub-optimally balanced landings. After dragging up your nose, try to refrain form the natural instinct to press back down on the nose. Allow the tail sufficient time to match the height of the nose, at which point it should become parallel to the ground. Keep faith, the board will balance out! When you reach the apex of your ollie, it is called the “peak.” Peaking with a smooth and stylish form is obviously difficult at first, but with practice you will begin to develop a nice, steady ollie. Guaranteed. When you peak, just relax and prepare yourself for a balanced landing. In a sense, you have to ‘work’ at keeping yourself relaxed, because the beginner’s instinct is to push down on the board to get back to solid ground as fast as possible. Don’t push down. Relax up there. Work at it. Q : Will I Ever Land a Decent Ollie? Yes! You will land amazing, awesome, beautifully perfect ollies many times over. Just keep practicing, practicing, practicing, practicing! 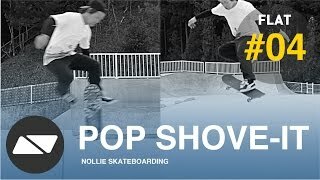 You can stay stationary and practice if it makes learning the ollie easier for you. Q : Can I Hold On to a Fence or Something as I Practice? Go ahead and try if you like, but it won’t help you learn other important aspects of the trick like finding your balance. Q : How to Ollie Higher? The absolute best training for increasing the height of your ollie is to ollie over things. Start with small objects like an empty soda can and make the obstacle progressively higher. Try to ollie over 20″(50cm) first. Q : How to Ollie Further? It generally comes down to speed. 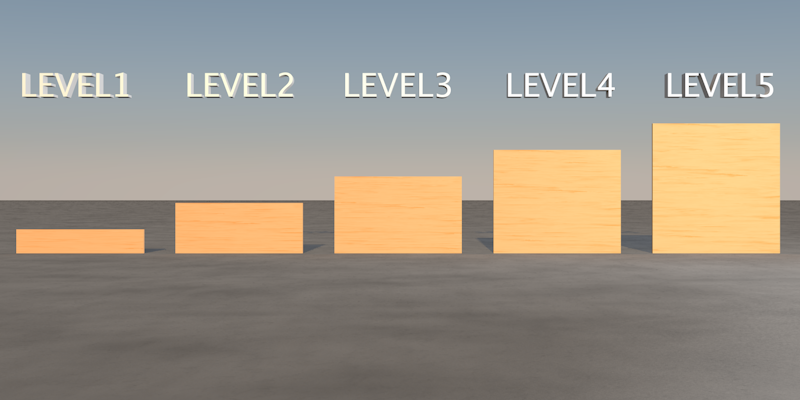 Gather momentum, spot where you want to land relative to your take-off point, and jump slightly more forward than you would otherwise so as to match the speed with which your skateboard will be traveling through the air. Q : How to Lean My Front Foot Forward at the Peak? This ollie is commonly referred to as an “Ollie Nosebone.” First of all, you need good ollie skills. The key for this ollie is your front foot. When you reach the peak, (gently!) push your front foot forward not moving any other part of your body. That’s it, simple yet difficult. Of utmost importance is practicing your regular ollie over and over in various conditions so that extension tricks such as the ‘nosebone’ come almost naturally with experimentation. Nevertheless, here is a movie explaining how to do it. We will happy to hear your question! Please ask us through REQUEST forum at top left. The official record for the highest flat-ground ollie is 45′ (114.3cm) by Aldrin Garcia during the “Maloof High Ollie Challenge,” held on the 15th of February, 2011. You can watch the movie here. However, a groundbreaking moment in the lore of the ollie will always belong to Danny Wainwright’s ex record of 44.5′ (113.03cm, ELEMENT-HIGHEST OLLIE CONTEST Feb.6th,2000.) Reese Forbes, a competitor of Danny’s in this contest, was also well-known as a master of the ollie. Yours truly’s favorite remains Jeremy Wray’s Tank to Tank Ollie. He ollied a huge gap between two huge water tanks. 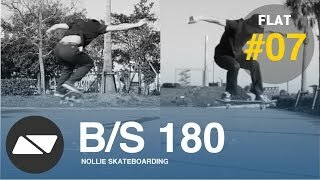 A few years ago, a Birdhouse skater by the name of JAWS released footage of a monster ollie down a 20 stair/gap combo roughly equivalent to a 25 stair-set. This footage made him famous, and he continues to ollie down frighteningly dangerous gaps and stair-sets today. As mentioned earlier, the skater who created the ollie is Alan Gelfand. The original mechanics of his ollie were first put to effect not on flat-ground but rather off the coping-ledges of concrete bowls as shown. Until that time, flat-ground skateboarding was known mainly as free-style skateboarding and was not popular. 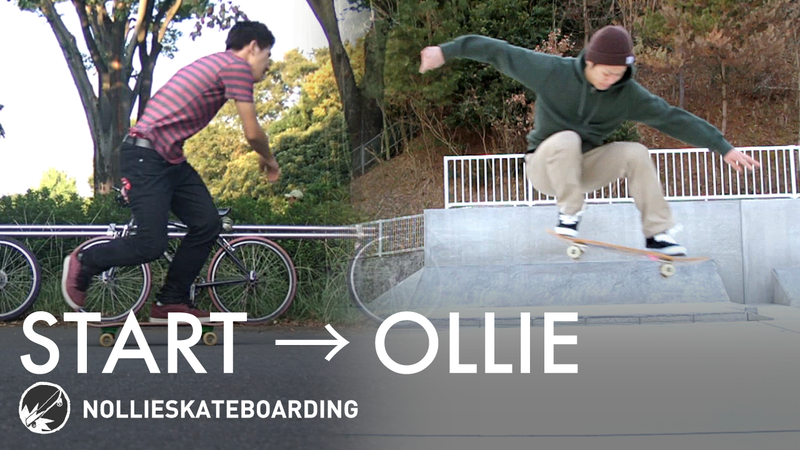 As skateboarding continued to decline in popularity, the coming of the ollie rejuvenated skateboarding completely and returned it to popularity. 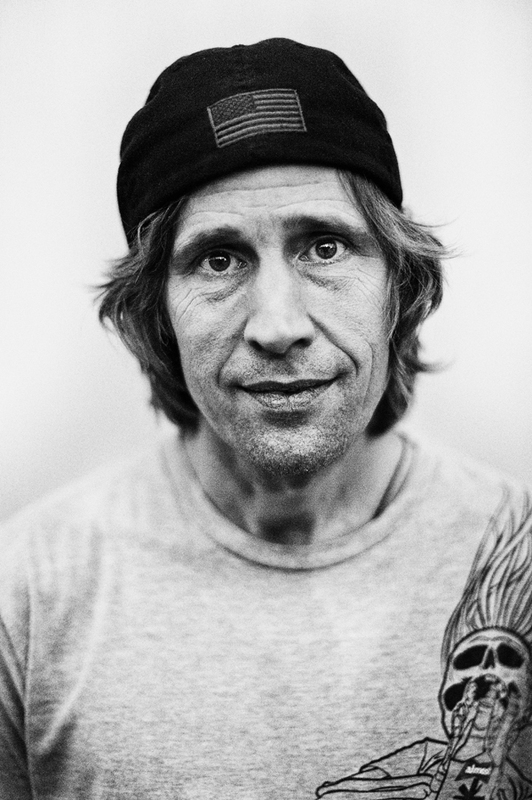 The ollie, therefore, is a monumental foundation in the history of modern skateboarding.